Tempur Pedic Review  - Is the Cloud Luxe Breeze Worth the Money? Our Tempur Pedic mattress review of the Tempur Cloud Luxe Breeze highlights one of the popular models in this industry heavyweight’s mattress line up. Tempur Pedic is pretty much the king of the memory foam mattress industry, and has been exerting its dominance in the mattress industry quite well over the years. Click Here to save up to 30% on select models of Tempur-Pedic and other deals! We won’t get into all the background or details, but Tempur Pedic applied the technology created by NASA for astronauts to be supported during liftoff on space trips. The founder of Tempur Pedic used this technology when it was released to the public in the 1980s and started the entire memory foam mattress phenomenon in the 1990s. Tempur Pedic clearly has earned their place in the industry, but their beds are not for everyone. They are quite expensive, are sold exclusively through in-store retailers, and don’t provide a lot of information about their materials or construction so it is hard to evaluate them compared to other memory foam mattresses. Many Tempur Pedic mattress reviews are either based just on specs from the company as few review sites can afford one and the company won’t send out a Tempur Pedic Cloud mattress to any review site as part of a Tempur Pedic bed review. Tempur Pedic has a LOT of models, but for this review we will evaluate the updated for 2019 Cloud Luxe Breeze model as it has the most features and is pretty much their flagship model. We want to note that we did NOT receive or purchase this model to review, as it is VERY expensive. We have purchased Tempur Pedic mattresses in the past, but their models have changed so much that we are going by in-store visits for our evaluation and this Tempur Pedic mattress review, much as you would if you went in a store and tried one out yourself. So this is the problem we found with Tempur Pedic. They don’t share a lot of information about their technology with anyone, as they consider it proprietary information, so it is hard to find out exactly what their materials are made of or the densities of the layers, etc..
Tempur Pedic is an all-foam mattress by design, as they eschew different or innovative mattress layers and tend to stick with their proven designs. They have come out with some new hybrid mattresses lately, but for the most part their memory foam mattresses stick to all-foam construction. The Tempur Pedic Cloud Luxe Breeze is actually quite soft compared to many of their models. The Breeze layer and TEMPUR CM+ layer are rather soft, and I would place them around a 4-5 on a 10-point scale (10 being the firmest). When you lay on the mattress, you sink into it quite a bit, especially if you are heavier like myself. The new Luxe Breeze models for 2019 offer both Soft and Firm models, which is a departure from the past, when the Cloud Luxe Breeze was known for being their softest model. In this review we largely evaluate the Soft version, but the features are generally the same for both firmness options – they just vary by the density of the foam which provides for the softer or firmer feel. Tempur Pedic does recommend a 2-3 week “break-in” period for your body to acclimate to the mattress, which is quite different than many other memory foam mattresses which pretty much are how they will be once you lay on them. This is often a complaint about Tempur Pedic, as initially it may seem hard or sleep hot, then over time you adjust to it. The Tempur Pedic Cloud Luxe Breeze is very soft and cushy compared to their other models. It is, however, a Tempur Pedic, so it doesn’t have any springy latex layers, gel layers, tufted cover, or anything that recent memory foam entrants have which we review on this site that compete much more affordably against Tempur Pedic. The top layer is soft and you do sink into it upon laying on the mattress, but as stated, it doesn’t have any special technology that provides its comfort compared to some other competing model. It is very comfortable, however, when your body molds into the foam, as Tempur Pedic is known to use high quality, heavy foam which conforms and adapts to your body rather well. The lack of special mattress technology, gel foams, copper, so on and so forth really isn’t needed by Tempur Pedic, as their quality materials handle everything it needs to. There’s a reason Tempur Pedic is the leader in the memory foam industry, and its because they have really high quality products that are quite comfortable. The cover is a thin cotton cover which all Tempur Pedic’s share, so you feel the memory foam instantly. There is no quilted cover or special top to the bed but that allows you to feel the foam and your body to react to it instantly which is good. 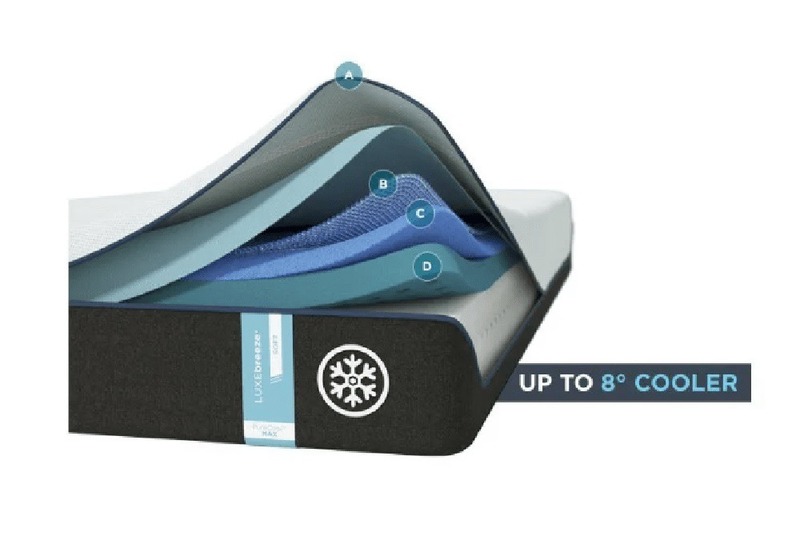 These innovations are equally as effective as some of the newer heat regulating technology that mattress upstarts are introducing including the use of copper, gel cooling layer or latex. Their new cooling technology does keep the mattress much cooler than previous generations of Tempur Pedic models for sure. Tempur Pedics are known for having very minimal motion transfer, due to the high quality dense foam used. The sinkage was a little pronounced as it is their softest mattress being that it is the Tempur Pedic Cloud Luxe Breeze Soft model. When I sat down on it, it compressed quite a bit – around 5-6 inches, which is significant. I do weigh around 230 lbs, however, and when Kaye laid down on it the sinkage was much lower. Again, this is the softest model they offer, so this is to be expected. It did not, however, cause me to sink down so far that I “bottomed out” like many of the cheaper, thinner 10″ bed in a box type mattresses, which is definitely a plus. The quality foams used by far prevent this which is why they cost a lot more than many online models. The firmer model of the Luxe Breeze prevents this, however, and is one of the reasons the company introduced multiple firmness options besides the super Soft model. Motion transfer was minimal when we both laid on the bed, which Tempur Pedic is known for. We could not feel each other when turning over side to side, which is a side effect of their dense foam and multiple layers. High marks for this from Tempur Pedic, and something that we expected from this top of the line mattress. Off-gassing to our knowledge was minimal with the current models, but in the past, when we purchased Tempur Pedics, there was a significant chemical smell. They seemed to have addressed this with the current models, and with their delivery of a mattress that is uncompressed, they seemed to have solved this issue. Something that definitely was corrected and the fact that they don’t show up in a box makes a big difference. All in all, compared to many of the Bed in a Box online mattresses that ship compressed and have an odor upon opening, the Tempur Pedics don’t have significant off-gassing or smell. Tempur Pedic sells through major mattress retailers exclusively, so you are at the mercy of their customer service. This helps them not have to deal directly with the customer, as you deal with the mattress retailer themselves. We had difficulty when trying to create this Tempur Pedic mattress review as we couldn’t get much information about the beds from the company. You do get a 90 day tryout, 10 year warranty, and in-home delivery guaranteed by Tempur Pedic. The company does realize their position in the industry, however, and doesn’t bend over for the customer. As we found, we couldn’t get additional information about their products or any call-backs. Whether this is indicative of their current customer support is not known, as most contact will be with the local mattress retailer which you purchase from. So this is the biggie. Tempur Pedics are EXPENSIVE. A queen Luxe Breeze retails around $4499 vs. $1000 for many of the new or online mattresses which have comparable technology and are also hand delivered to your home. However, if you have the money, and want the best – then by all means go with Tempur Pedic. They are well built from quality materials and did start the memory foam mattress industry. As you can see in the price table below, a Tempur Pedic Cloud Luxe Breeze split king mattress retails for $7998!! You can, however, order one these days at up to 30% cheaper by clicking here – we recently saw them offering Split King models for $3900 instead of the prices you can see above!! This is a ridiculous sale and something that won’t last, and as of this publication they may have sold out. As mentioned, the company tends to change what models are on sale, so those savings aren’t always representative of what is currently being offered. While we acknowledge Tempur Pedic’s position in the industry, and its founder status as the king of the memory foam mattress, the price compared to hungry upstarts and direct-to-consumer eCommerce retailers has weakened their position in our opinion to a degree lately. In the past, when they were pretty much the only or best choice for memory foam mattresses, they simply were the only horse in the show. Now, however, new entrants that are under $1000 are really taking a run at Tempur Pedic and saving a lot with the direct-to-consumer model, saving a lot for the consumer by cutting out the store distribution model. Many of these new mattress companies have as good quality and materials if not in some cases better with liberal sleep trials (Nectar offers 365 nights), great warranties, and delivered to your door with minimal hassle. But it is hard to beat the king of the memory foam mattress especially when they run some of their heavily discounts online. The high density foam, direct-delivery model, and now reduced sale prices online, make Tempur Pedic a much more affordable model for what you get – and the Tempur Cloud Luxe Breeze definitely delivers for what you get. For reduced motion transfer, a soft, comfortable bed, and one that gives you the highest quality on the market from the original innovators, its hard to argue with not choosing a Tempur Pedic. If you want the best, and have the money – then by all means go with a Tempur Pedic bed. They are very well built and use high quality materials, just may not be the best value compared to what you can purchase online. But you do get what you pay for, and they really are worth the money if you have it to spend! Hopefully this review of the Tempur Pedic Cloud Luxe Breeze helps you in your next purchase of a new memory foam mattress! (And if you aren’t made of money, Just at least do some research on their site and try to save yourself up to 30% by clicking here – these deals won’t last!). Let’s take a close look at today’s latest and most advanced memory foam models: Tempur Pedic’s updated Cloud Luxe and Nectar Mattress. Both of them are luxurious and boast of their impeccable make and top notch quality. Tempur Pedic is popular for its memory foam mattresses, making them one of the more dominant brands in this industry. Nectar, despite being relatively new in the market, is geared to creating mattresses that speak of ultimate comfort. Read the full Nectar vs. Tempur Pedic comparison. Are you in the market for the best memory foam mattress? Do you know what to look for when buying such mattress? Memory foam mattresses have proven to be a fast-growing alternative to traditional innerspring mattresses. They contour to the body perfectly and provide extraordinary comfort and support, and knowing what to look for is of crucial importance in finding a memory foam mattress that will best fit your needs. In today’s review, we’ll be comparing two all memory foam mattresses: Loom and Leaf and Tempur Pedic, coming from two well-known mattress manufacturers Saatva and industry heavyweight Tempur-Sealy. Read the full Loom and Leaf vs. Tempur Pedic review. The innerspring mattresses used to be the leading choice for bedding for many years in the past, but since the invention of the memory foam by NASA in the 1970s, which promised to relieve pain and provide quality sleep, this was no longer the case. This discovery prompted people to seek the mattresses capable of providing the comfort they needed and meeting all their sleep needs and preferences. As the result, many types of memory foam mattresses emerged offering numerous benefits, and Tempur Pedic was one of the first mattress companies to launch an all memory foam mattress. However, although Tempur Pedic were the pioneers in memory foam mattress industry, and although they may have the name recognition, it does not necessarily mean they are the best. There are many other mattress companies offering memory foam mattresses of the same or even better quality, and today we’ll be comparing the Tempur Pedic’s vs GhostBed to illustrate the differences between different types of memory foam mattresses and help you choose the right one for your needs. Read the full GhostBed vs. Tempur Pedic comparison. Click here for more Tempur Pedic mattress comparisons.